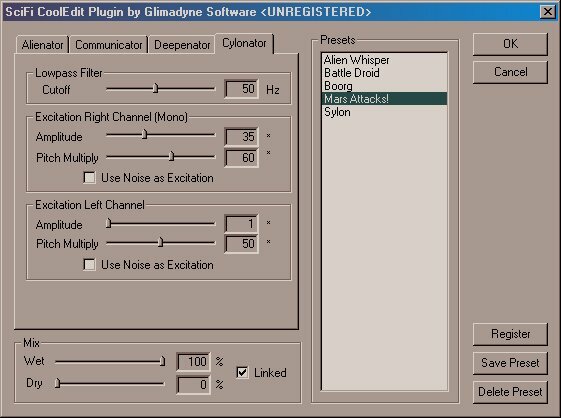 The Cylonator tab in the SciFi Plugin allows you to transform your voice into a robot, ghost, or alien-like being. This effect uses a vocoder which is quite popular in modern music. It has also been used in many different movies in varying degrees. Some examples where this effect has been used are from: Star Wars: The Phantom Menace, Battlestar Galactica, and most notably the music by KraftWerk. Sets the cutoff frequency of the filter used in the vocoder. The lower the frequency, the more intelligible the resulting speech will be. This value also effects the pitch of the synthesized speech via the Pitch Multiplier. The higher the filter cutoff, the higher the pitch range will be. The SciFi vocoder is a stereo vocoder, meaning that the left and right channels are analyzed independently. There are controls for right and left channels. Sets the amplitude of the excitation signal that synthesizes the speech. Increasing this value will increase the volume of the resulting speech. However, for very high signals you must set this appropriately, or clipping in the resulting speech can occur. If this does, lower the amplitude. This sets the relative pitch of the resulting speech. Increasing this value increases the pitch, decreasing it lowers the pitch. This can also be used in conjunction with the Cutoff Slider. If you want to increase the pitch even further than the Pitch Multiplier will let you, by increasing the Cutoff Slider, the Pitch Multiplier range moves up (like a window) to offer a higher pitch range. This concept works the same for achieving lower pitches as well. So, the lowest pitch you can get is having both sliders all the way to the left. You can use different pitch values for stereo signals to emulate chords or interesting voice effects. When enabled, the excitation signal is white noise. This gives a ghost like or raspy sounding synthesized speech. When this is used, the Pitch Multiplier Slider is disabled. You can use this on the right or left channel, or both to create interesting voice effects. The included presets demonstrate many of the functions of the sliders and some commonly used effects. Please try them out, the best way to find cool effects is to experiment with the controls. Sci-Fi Deluxe is a trademark of Hyperdyne Labs. All other products, movies, games, and material mentioned are registered trademarks or trademarks of their respective companies. This product is in no way affiliated or endorsed by any of the respective companies.